What’s a newspaper? That’s a question that future generations might very well ask. Technology is changing all time. The way we access information today has completely changed the game for traditional news media. Ken Doctor author of Newsonomics: twelve new trends that will shape the news you get, writes how online media today offers so many more choices than before. That’s one reason why so many people have moved to online for their media needs. The biggest innovation that has made the most impact on the way we get our news are mobile devices. In an article from MSNBC it states there is new report that shows 27 percent of Americans now get their news from mobile devices. The findings are from the 2012 State of the News Media Report by the Pew Research Center’s Project for Excellence in Journalism. According to Pew “More than 80 percent of smartphone and tablet news consumers still get news on laptop or desktop computers. On mobile devices, news consumers also are more likely to go directly to a news site or use an app, rather than to rely on search — strengthening the bond with traditional news brands.” So many people have iPhones these days that it is only convenient to use it for media purposes. Why go buy a newspaper when you could reach into your pocket and get your news for free? Pew researched that 35 percent of Americans have smartphones. 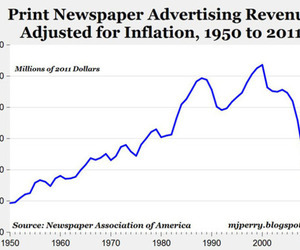 That number is only going to increase, and that will only diminish newspapers more. Doctor (2010) writes how traditional media was slow to adapt to the digital revolution. If newspapers and other media stations don’t continue to incorporate the internet and mobile devices they will fail. Doctor (2010) says that this is part of the “The Reader Revolution.” He writes that people are not rejecting newspapers its just that online media is more convenient and provides more options. Why read a paper with limited stories when you could find a news site with tons of stories with many sources. Another aspect Doctor (2010) highlights are the “Aggregators,” which is having more information than the other “guys.” An example of some of new aggregators is Facebook and Youtube. Anyone can locate a story and post it on social media sites for everyone to see. The MSNBC article mentioned earlier wrote about Pew research on news consumption habits for adults. It states that, “Social media’s role is important in the future as a driver of news,” and “9 percent of traffic to news sites now comes from Facebook, Twitter and smaller social media sites. That is up by more than half since 2009.” Doctor (2010) talked about Google being a “search-aggregation company.” What this means is that Google uses a powerful search technology that focuses on content from other people. It allows anyone to find anything they want quickly and simply. Another reason for the decline of newspaper Doctor (2010) says is the “Advertising Revolution.” Advertisers are focusing more attention on online platforms than they are on newspapers. In an article from The Verge it reports a 17.7 percent reduction in 2008 and a 28.6 percent in 2009 in spending for advertising in print media. This less ad revenue is taking serious tolls on papers. In a New York Times article writes that the McClatchy Company a owner of multiple newspapers had to cut 1,400 jobs. This is only going to get worse as we move closer to a completely digital medium. It’s not if newspaper will fail anymore, it’s when will they fail. A Washington Post article reported that the amount of Americans that buy newspapers now is down by 31 percent since 1940. Another article from the New Yorker talks about how Philip Meyer author of the “The Vanishing Newspaper,” “predicts that the final copy of the final newspaper will appear on somebody’s doorstep one day in 2043.” It’s hard to tell exactly when it will happen but there’s no doubt technology has changed everything and there very well be a day when someone asks what’s a newspaper?